It would take 1500 high-definition television screens to display just one image from the 3.2- gigapixel camera. The gigantic 3.2 gigapixel camera will weigh 3 tons and will be the size of small car. The primary duty of this giant photographing gadget will be giving humans a clue about the universe. From the origin of the galaxies to early warning systems of impending asteroids of extinction, to the ominous sounding dark matter and dark energy, the 3.2 gigapixel camera will be keeping watch over the night sky and will be providing raw pictorial data that will keep researchers very busy for the next few decades.The world’s most powerful digital camera will reveal new details of the universe and help unravel some of its greatest mysteries. In a single shot the camera will capture an area of the sky 40 times the size of the full moon. 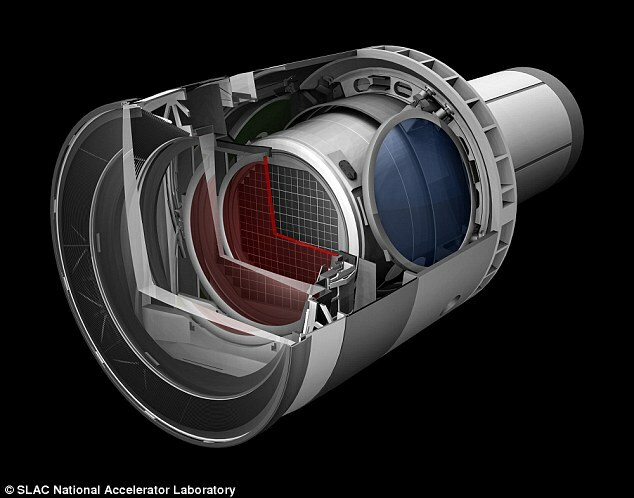 The LSST camera will boast a 1.6 m diameter front lens and a 63 cm diameter focal plane with a whooping 3.2 billion pixels. It will generate close to 6 million gigabytes of data at a 365 day period. That’s the equivalent of shooting 800,000 pictures with your presumably state-of-the-art iPhone 6 camera!.The LSST also features a unique filter-changing system that will allow the camera to record anything from near-ultraviolet to near-infrared wavelengths of light. These filters combined with the wide aperture and 3200-megapixel sensor of the LSST should give scientists a tool 1,000 times more capable than today’s best telescopes . If you think your thousand dollars iphone has enough capacity to carry a year worth of selfies, then wait for this; When this imaging ggadget is eventually online in 7 years time, it will take 20 terrabytes worth of picture size per night!. That means it will take 312 64gig iphones or 624 32gig IPhones to store just a night worth of images from the LSST. The details of videos shot using this monstrous camera is most certainly unrivalled and may remain so in decades.The camera itself will take five years to build,after which it will eventually be installed into the small-car-sized LSST at a site that has already begun construction on Chile’s Cerro Pachòn mountain.Components of the camera are being built by an international collaboration of universities and labs, including DOE’s Brookhaven National Laboratory, Lawrence Livermore National Laboratory and SLAC. SLAC is responsible for overall project management and systems engineering, camera body design and fabrication, data acquisition and camera control software, cryostat design and fabrication, and integration and testing of the entire camera.